This is the guy who had the bright idea to homeschool in the first place. For whatever reason, he wants the kids to be homeschooled by his wonderful wife. This dad is completely convinced that his wife is the one for the job – she’s much less certain of her abilities. How can you spot this dad? He leads the way through the vendor hall while juggling the speaker schedule and the map. He stops at every table and grabs up brochures and hands them off to his wife. He pushes her toward each table to chat with vendors. And he marches into all the homeschool mom encouragement talks with his wife in tow. This guy is fired up about homeschooling! Here is the homeschool dad who is the opposite of the cheerleader type. His wife was the one to bring up the crazy idea of homeschooling and he’s just not sure about this new venture at all. He is there because he wants to prove to himself (and to his wife) that homeschooling is impossible and homeschoolers are weird. He did agree to try the convention and listen to the speakers, so it’s his wife’s one hope of converting him. How do you spot this dad? He will spend more of his time observing other homeschoolers – trying to pick out all the “weird” ones. This dad will be trailing an extremely enthusiastic wife who tries to push him to the front of the crowd at every vendor booth and who drags him to the front row of every speaker’s talk. He will ask the skeptical questions and will look for the flaw in every curricula. He is very unsure about the “homeschool” thing. This guy is only at the convention for one reason – to reign in his wife’s spending and carefully guard the pocketbook. He has his thoughts on the budget at all times. His wife tries to drag him to the different booths to prove how much she “needs” all the products. He walks a few steps behind his wife to every booth and looks less than thrilled to be there. He looks skeptical during all the vendor talks. His wife is enthusiastically trying to “sell” each product to him. By the end of the day he will look worn down and grudgingly open his checkbook at each booth to save himself from his wife’s sales pitch. This is the dad who is only there to offer support by being the one to hold all the items and load the car when the day is through. He may have come enthusiastically to the convention only to find that he would rather be anywhere else once he actually arrives. He might find the convention overwhelming and exhausting. Yet, he’s there to support his wife, even if he’s holding all the bags. He will be standing off to the side or even in the nearest corner looking very lost. He will have a baby strapped to his back, a backpack, a convention bag, water bottles, sippie cups, and will be guarding the stroller. As his wife moves to a new row in the vendor hall he will march forward, grab the newest brochures, and quickly retreat to the safety of his little edge of the room. During all the vendor talks, he will be either sitting outside the speaker room playing with the baby or pushing the toddler through the halls in the stroller. At one point or another I think my hubby has been each of these. Now, he’s a new kind of homeschool dad – the absent one. He doesn’t head to conventions with me. No, he stays at home and keeps the kids so I can have a kid-free time to shop and listen to speakers. He encourages me to go and enjoy workshops, he gives me a generous budget, and he sends me out the door with some waterbottles so I can have some wonderful time by myself. And then he’s so sweet to go through my purchases with me and feign interest. He’s an experienced homeschool dad now! How many dads have you seen at conventions? And guys, note that this is a lighthearted look at homeschool conventions. Yes, I’m aware that there are dads or grandparents or uncles or cousins that homeschool, so their situation might look different. Homeschool dads are awesome, no matter what “type” of dad they are. My husband is an absolutely awesome support system for me. He’s played the role of all of these dads at one point, and through it all he encourages me. So, how do you attend homeschool conventions? With the hubby or alone? 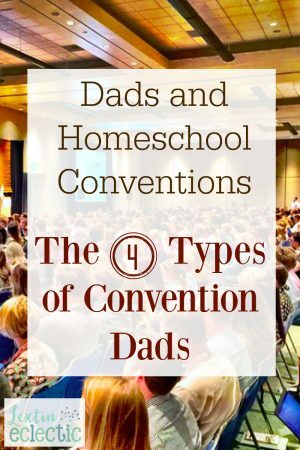 And if you want to read more about homeschool conventions, be sure to read the 5 C’s of Homeschool Conventions. You just might be inspired! ROTFL! Love this! My husband's going to TTD with us today. 😉 It will be interesting to see where he falls into this. Mine is usually the absent one — he went with me once and fell asleep LOL!